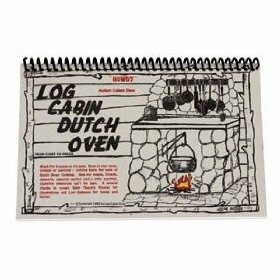 The best campfire cooking Dutch Oven recipes we've found are in this little book from Camp Chef called the "Log Cabin Dutch Oven Cookbook." It's really great for a beginner or even the experienced outdoor cook and will have you making perfect Dutch Oven recipes the first time. The little book talks about Dutch Oven style cooking methods and equipment, and helps you learn how to judge coals, how to store and stack your Dutch ovens and a whole lot more. If you're looking for great recipes check out the little Log Cabin Cook Book . There's another book that we really enjoy especially if you are new to using a Dutch Oven it's call "The Beginner's Guide to Dutch Oven Cooking." It's a good book because it will teach you how to season, and clean your Dutch Oven properly so it won't rust. The cookbook also has great suggestions for campfire cooking techniques, campfire cooking equipment, campfire cooking utensils, campfire cooking tools, plus lots of great recipes including one for pizza! Here's the recipe I use for making Dutch Oven Pizza. Brown the beef and garlic. Mix flour, salt, seasoning, baking pwder and milk together. Spread the beef in the bottom of your Dutch Oven and pour mixture on top of it. Bake with coals on top and bottom for about 25 minutes. Top with cheese and veggies and cook an additional 20 minutes until done. You'll want to rotate the oven on the coals and check it often so it doesn't burn.